Offering you a complete choice of products which include Oilless Self Lubricated Bearing such as Oiless Self Lubication Bearing, Self Lubricated Bearings and Metallic Bearing. Backed by a team of experienced professionals, we have been able to manufacture and supply Oiless Self Lubrication Bearing. Demanded for engineering and automotive applications, the offered bearing is available with us in different specifications. 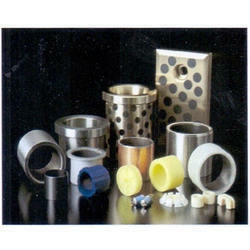 Post-manufacturing, the offered bearing is checked rigorously on various parameters to ensure high strength. Looking for Oilless Self Lubricated Bearing ?